Construction companies George Wimpey and Taylor Woodrow have agreed to merge in a deal that will create the UK's biggest homebuilder, worth about £5bn. The new company will be called Taylor Wimpey and will be large enough in terms of market value to merit a place on London's main FTSE 100 stock index. The new firm will have a 14,000-strong workforce. Fewer than 5% - about 700 - people will lose their jobs, they say. Shares in Taylor Woodrow closed nearly 13% higher as Wimpey shares rose 2.8%. 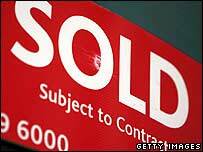 George Wimpey chief executive Peter Redfern said that most of the job losses would be in the UK. Ian Morris, a spokesman for Taylor Woodrow, said the job cuts would result from the companies creating a single UK corporate headquarters, and one operations head office for homebuilding. Job cuts would probably be in the "hundreds, rather than going over 1,000", Mr Morris said, although he added that "nothing is cast in stone". Analysts responded enthusiastically to the proposed deal. Woodrow shares closed up 13% at 475 pence on the news, while Wimpey shares were up nearly 3% at 653p. "The Wimpey-Taylor Woodrow deal makes good sense," said Colette Ord, an analyst at Numis. "It's a good strategic fit and the synergies they're targeting look realistic." The firms said the merger would allow them to cut costs by £70m a year and boost business in both the UK and US. Mr Morris said that joining forces with Wimpey and its efficient house building team would allow Taylor Woodrow to better exploit its UK land bank. At the same time, in the US the new company would be a bigger player in a market where at present the two firms were successful, but smaller, than many of their rivals. The housing market in the US is experiencing a slowdown as higher interest rates dampen consumer demand and increase repayment costs. Many observers are predicting that the UK housing market also will stop growing as quickly as in past years, mainly because of an increase in interest rates. However, Taylor Woodrow's Mr Morris said that the underlying market in both the UK and US was stable and there was a steady demand for new houses. 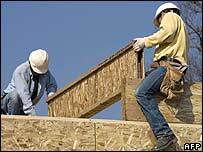 He explained that the UK currently needs about 200,000 new houses a year, though only about 150,000 are being built. After the merger, Taylor Wimpey will have a total of 22,000 UK house completions a year, with another 9,000 a year in the US. Wimpey's chief executive Peter Redfern will take control of the merged company, while the chairman of Taylor Woodrow, Norman Askew, will remain in that role. The new company will be 51%-owned by Taylor Woodrow shareholders and 49%-owned by George Wimpey investors. Analysts said that there was a good chance of more consolidation in the UK house building sector, and shares of rival firms Persimmon, Redrow, Bellway and Bovis Homes all rose on the London stock market. In February, Wilson Bowden has agreed to be bought by rival Barratt Developments in a deal worth £2.2bn.